Author: Christa Kilian-Hatz. Series edited by: Rainer Voßen. 4 pp. Roman, 365 pp. The Khwe language belongs to the Khoisan family. It is linguistically classified as a member of the Kalahari Khoe languages which form a subgroup of the Central Khoisan or ‘Khoe’. Khwe is closely related to ||Ani or ||Ani-Khwe (the language of the ||Ani-Khwe who are sometimes called ‘Water-Bushmen’). ||Ani is spoken in the Okavango delta and in the area of Sepopa in Botswana. Brenzinger (1997) estimates the total number of Khwe people to be about 8,000. Most of them live in the Caprivi Strip in Namibia, but some in Angola, Botswana, and Zambia. A larger group of Khwe (about 1,600) nowadays live in Schmidtsdrift in South Africa. Parts of them living in close economic contact with the neighbouring Mbukushu, a Bantu speaking community. - Bùga-Khwe (lit. Bush-Khwe); i.e. (the dialect of) the Khwe living in Botswana. Most of the data derive from multiple researches in the West Caprivi with speakers of ||Xóm Khwe in the years 1997 to 2002. 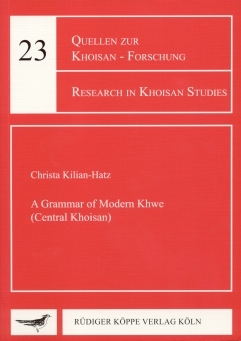 Additionally, numerous texts from the works of Oswin Köhler which have mainly been collected from Buma-Khwe informants, as well as a small text collection of Heine (1997) recorded from ||Xó-Khwe and ||Xóm-Khwe are being examined in this grammar. Unfortunately, no linguistic research has been done yet in the Buga-Khwe area.